It's great to be here at Red State Rebels! I'm Erick Gray with the LaRocco campaign, and I'm here in Idaho Falls live blogging tonight's U.S. Senate debate between Larry and Rex Rammell. It's the 6th debate in the U.S. Senate race, part of Larry's commitment to reach out to every voter and make sure they know that he is the candidate who will bring real change to Idaho and put Idaho families first. 8:06 pm Rammell says that unions are the reasons jobs have gone overseas. Larry says that education is the key to keeping jobs in America, along with keeping unions and strenghtening the middle class. 7:57 pm Rammell has just compared Larry to a communist. He has stated that goverment has way too much control. 7:53 pm Larry says we should harmonize healthcare. 7:40 pm Rammell has just stated that healcare is not a right. He has stated that it is on the individual to get health insurance. He has also stated that those with out health insurance should be refused. 7:40 Each Canidate was given one chance to ask the other a question : Larry checked on Rammell's father. Rammell asked Larry where does the federal governmants role end when it comes to states rights? Larry says eduaction is a good place to draw the line. Larry says he is very careful on gorvernmant involvement. 7:38 pm Rammell has just called Obama and McCain socialists. 7:36 pm Larry has stated that he is willing to stand up to any president for What is best for Idaho. 7:30 pm Did the troop surge work? Larry wants a plan for withdrawl, and he say we need a surge in diplomacy. Rammell states that the war would have been over if the enemy didn't see split positions on the war. 7:28 pm As far as phylisophy Rammel has Identified himself with Risch's view. He has just stated also that Risch is deceptive. 7:26 pm Larry says that he is not running because the conservative ticket is split. When he started There were many many people in the primary race before he even knew who Ricsh and Rammel were. 7:23 pm Rammel states that he is running because of his elk, and he thinks he has what it takes to be the next Idaho State Senator. 7:20 pm Rammel says the free market will fix healthcare system. Rammell says the government has no constituional right to be in healthcare. 7:18 pm Larry states that healthcare will be our next crisis. He is for a universal healthcare system. 7:15 2nd question is about drilling. Rammell says that he supports gas, nuclear, and the rest. Larry supports alternative sources and nuclear, and to move anyway from a dependence on oil. 7:11 pm First question: Do You Spport the Bail Out plan. Larry says that he supports it as he has stated in previous statements. Rammell does not support the bail out, concerned about giving the goverment too much power. 7:09 pm Rammell states that he is running as an Independent because he is upset with the Republican party and that they are playing games. 7:02 pm Risch was invited by Neil Larson who is moderating. He unfortunately could not attend. 7:00 pm Canidates have taken their seats and Larry looks calm and ready to go. This is Cyrus Osborn with the LaRocco campaign. I'm here in Lewiston blogging the U.S. Senate debate with Democrat Larry LaRocco, Independent Rex Rammell, and -- for the first time -- Republican Jim Risch. We're glad that, in this 5th debate, Jim Risch finally decided to show up and debate! 7:30pm: And that's the closing bell! LaRocco is ready to fight for working families, Risch is ready to fight for big oil, and Rammell is ready to take down the U.S. Department of Education. 7:26pm: LaRocco talks to Idahoans; Risch reads from a script. 7:16pm: Rammell calls Risch a conservative, centrist, liberal. 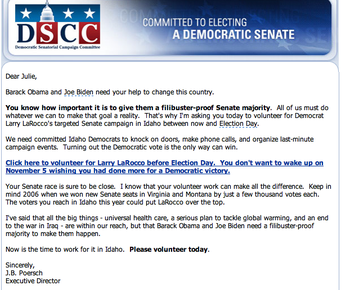 7:11pm: LaRocco wants to create jobs in Idaho and protect our environment. Rammell doesn't buy global warming. Risch doesn't say much. 7:08pm: Risch says we need an energy plan, but he doesn't have one! 7:00pm: Larry is the only candidate with a plan on Iraq and national security... among many other things. 6:58pm: Risch struggles to explain why he snubbed the students at U of I and C of I. 6:53pm: Rammell says U.S. Department of Education is unconstitutional. 6:48pm: LaRocco hits Risch on raising food tax while showing a strong understanding of the farm bill. 6:45pm: Red-on-red assault: Rammell gets nasty on Risch not being a TRUE conservative! 6:42pm: LaRocco speaks truth on his strong record defending North Central Idaho. 6:38pm: Larry brings the rescue package home to Main Street with Simmons Sanitation. 6:33pm: LaRocco is introduced as the only veteran and as the only candidate with federal experience in the race. 6:30pm: LaRocco is on stage looking strong and relaxed. 6:25pm: Coin Toss -- LaRocco's first victory of the night! Tonight's debate was a HUGE win for Larry! Thanks to all of you for checking out my live blog from Lewiston. We'll post a link to the online video of tonight's debate as soon as we've got it. Thanks again, and good night from Lewiston! We had the live feed here earlier this evening. Click here for the recorded version, although it seems the first 15 minutes or so are missing. I'll replace it with a better link if the campaign provides it.